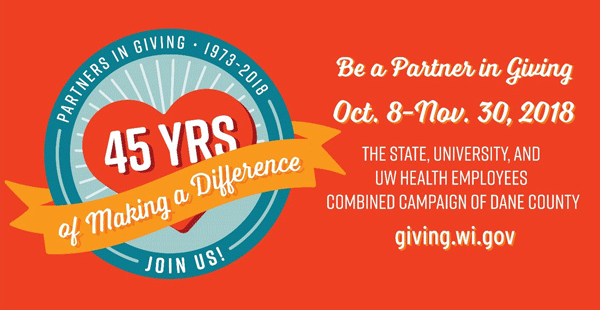 Every fall, university (including SMPH), UW Health and State of Wisconsin employees join to raise funds through the Partners in Giving campaign to benefit more than 500 local, regional, national and international charities. SMPH in particular has a long history of improving lives in our community, including our patients and research participants and their families, through direct medical care, research, local partnerships and philanthropy. SMPH will be holding a Partners in Giving drawing, including all campaign participants, for prizes such as hockey tickets, autographed hockey pucks, wrestling tickets and Wisconsin Union ice cream vouchers! Please act now with your pledge to make a difference, but certainly do so by November 30, 2018!